Colette, Beth, Carla, Jolene and Linda discussed John Berendt's City of Falling Angels, about Venice just after the Fenice Opera House was burned down in 1996. Beth had suggested the book after it had been given to her by her father-in-law, an avid opera-goer who has been to the Fenice. Beth pointed out that the author is based in New York but stayed in Venice off and on for 9 years until 2005. His writing is in the style of Truman Capote and Tom Wolfe, labelled "new journalism" or "literary non-fiction." 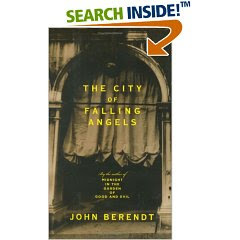 Berendt was drawn to Venice in the off-season and liked the city's magical beauty and unreality. He also apparently enjoyed investigating the mystery of the Fenice fire, considering the possibilities of arson, negligence, an Act of God, and even the sinister work of the Mafia. (Note that in the end, two electricians were found guilty of arson, and the one who had fled the country was apparently arrested in Mexico last year.) Berendt says that the feedback he gets about his writing is that people are drawn to his eccentric characters, whom he sees as artists. Long time Book Clubbers may remember discussing his Midnight in the Garden of Good and Evil several years ago. Beth concluded by saying that she herself found the book uneven, with Berendt's depiction of places like the Barbero Palace well done, on the one hand, but his failure to pull all the pieces of the narrative together, a drawback on the other hand. The evening ended with a clip from the film version of Wings of the Dove by Henry James, a turn-of-the-century period piece shot in 1997 in the Barbero, where James himself had been staying. Well I finally finished the book (August2, 2008). I enjoyed the book mainly because it gave me a mental picture of life in Venice. It has given me a hankering to visit the city. If and when I do, I will bring with me a list of the places Mr. Berendt described. I especially would like to see the Hidden Nest where Ezra Pound and Olga Rudge lived and the Santa Marie Dei Miracoli.